In a small sample of 24 covers and cards sent from Russia to the USA between April 1917 and July 1918, I notice that all 16 covers have been opened by British censors though none of the cards have visible British censorship. At the Russian end, 23 items have been visibly censored: they show violet censor cachets or paper seals or both. One letter has US censorship applied on entry to the USA.. Among the sample, I picked out these three covers from the publishing house of Abraham Stybel, born in Poland in 1884 died in New York in 1946. His interests included contemporary Russian art and literature and Jewish questions: note the "Art Nouveau" style in which his name and address is printed at top left. I just assume the covers are to his brother but I cannot get a Google fix on that. Covers to Joachim Stybel are often seen in dealers' boxes and even in auction. The three below nicely illustrate the three Foreign Tariffs which were applied through the period of the Provisional Government and the first year of Soviet power. I have no mail to America via the Western route after July 1918; most mail after that date goes out from White-controlled areas through Vladivostok. 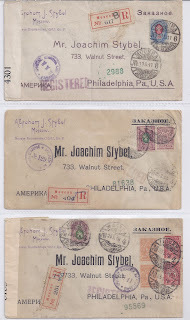 Commercial correspondence, Registered letter from the publisher Abraham J. Stybel to his brother (?) in Philadelphia sent from MOSKVA 1 EXSPEDITSIA 11 5 17 with circular violet Moscow censorship mark, British censor tape and on the reverse NEW YORK .N.Y. REG’Y DIV. 7 14 17 and Philadelphia arrival July 10 1917. Allowing for the difference in calendars, about six weeks in transit. Franked at 20 kopecks, the correct Foreign Registered Letter rate.